Vapor barriers and air sealing: How much and where in a dry, heating climate? We are in the process of framing our final wall on our small, single story slab on grade in Northern New Mexico, so it’s an important time to start thinking about air sealing and vapor barriers. So far we’ve done a bead of caulk above and below dow sill seal and around penetrations to seal the sill plate. A final bead will go along the inside edge. We are also planning to caulk between double top plates and california corners. The question now is how to most efficiently and effectively address air sealing for the rest of the structure. Our planned wall assembly, inside to out, is drywall, R-19 fiberglass batts, 5/8 OSB, 2″ polyiso, drainwrap, lathe, 3 coat stucco. For the roof, drywall, 6 mil plastic, 2″ polyiso, R-38 fiberglass batts, 2″ vent, 23/32nd OSB, pro panel metal roof. This is a single pitch 4/12 roof. This is a predominately cold and dry heating climate with big temperature swings. I was talking with my uncle who has been a builder here for 40 years. He was explaining the importance of dry heat for optimal performance of fiberglass insulation, hence his recommendation to put the 6 mil plastic on the ceiling. The heat moves through but not moisture and slow bakes the fiberglass. I was planning to tape the foil faced polyiso for this effect, but he thinks it’s a waste of time and effort vs the 6 mil poly. He also advised putting poly under the drywall on the walls. This caused a bit more concern as it seems it could potentially trap moisture in the wall cavity, especially since I had planned foil faced polyiso under the stucco, also taped. He suggested leaving somewhere for the moisture to go. He also suggested using EPS instead of polyiso, both for the lower cost and I would assume moisture resistance. I’d prefer polyiso for it’s lower environmental impact and high performance. 1) Poly or no poly behind drywall for the walls? 2) Should I skip the foil faced on the exterior wall foam / does taping the foam seams make sense for this assembly/climate? 3) Related to (2), is it a waste of time to seal all the osb and framing when exterior foam and drywall seem like a much easier place to address air leakage? 4) How do you plan for the condensation point with foam over the sheathing? Seems it would likely land somewhere in the middle of the wall assembly which is no bueno. A zero permeability interior and exterior vapor barrier (poly + foil) seems dangerous, but so does condensation anywhere inside the wall. I understand this is very climate specific, so even if it does not apply to your particular building experience, I’m curious to hear a building science answer to at least have some theory wrestle with. Too many vapor barriers! Help! First of all, let's establish your climate zone. It sounds like you are in Zone 5. Here is a link to the climate zone map. Q. "My uncle suggested leaving somewhere for the moisture to go." "Water doesn’t need to escape from your house. Although it’s true that indoor air is warm and humid during the winter, while outdoor air is cold and dry, that doesn’t mean that indoor moisture needs to “escape” from your house. It’s perfectly OK if the indoor moisture stays where it is without “escaping.” Some old-time carpenters look at walls that include a layer of rigid foam and exclaim, “That won’t work! If you put in a layer of foam, the moisture will have nowhere to go!” Moisture in your home isn’t like your retired parents in Michigan on New Year’s Day, itching to go to Florida. The moisture can stay right where it is, all winter long." Q. "Poly or no poly behind drywall for the walls?" A. Since your walls will have exterior rigid foam, you don't want any interior polyethylene. For an explanation of why this advice makes sense, see "Calculating the Minimum Thickness of Rigid Foam Sheathing." Q. "Should I skip the foil faced on the exterior wall foam?" A. Installing rigid foam is a good idea. Foil-faced polyiso will work fine. So will EPS, with or without foil facing. The advantage of a foil-faced rigid foam is that it is easier to tape. Q. "Does taping the foam seams make sense for this assembly/climate?" A. Absolutely. Attention to airtightness always makes sense. Q. "Is it a waste of time to seal all the OSB and framing when exterior foam and drywall seem like a much easier place to address air leakage?" A. Air sealing efforts are almost never a waste of time. Whether or not you need redundancy (basically, multiple air barriers) depends on your airtightness target and your budget. Q. "How do you plan for the condensation point with foam over the sheathing? Seems it would likely land somewhere in the middle of the wall assembly which is no bueno." A. I'm not sure what you mean by "planning for the condensation point." The idea is to specify enough rigid foam on the exterior of your wall sheathing so that condensation does not occur. 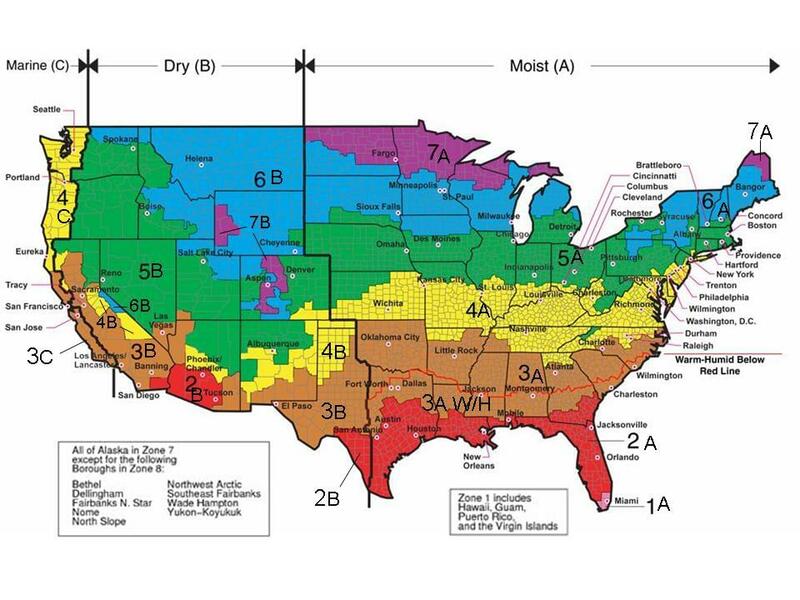 In your climate zone, your rigid foam needs a minimum R-value of R-7.5 if your walls are framed with 2x6s. Q. "A zero permeability interior and exterior vapor barrier (poly + foil) seems dangerous, but so does condensation anywhere inside the wall." A. Skip the interior polyethylene, pay attention to airtightness, and everything will be fine. Thanks so much Martin! What an incredibly detailed response! You are correct this is climate zone 5. So no polyethylene on the walls, but still ok on the ceiling? I’m curious to hear your opinion about baffles for the vented fiberglass roof assembly. It seems that putting rigid foam or plastic baffles above the fiberglass contradicts the purpose of a vented roof assembly. If you put a vapor barrier on top of fiberglass, the vent no longer can wick moisture out of the fiberglass. I noticed the JLC book recommended felt paper. Is there really a significant loss of R-value if the fiberglass is exposed directly to the vent channel? Would it make sense to use paper-backed batts with the paper facing up? Q. "So no polyethylene on the walls, but still OK on the ceiling?" A. There is no code requirement for a vapor barrier on the interior side of a vented roof assembly (your ceiling). In general, what matters is airtightness -- you're worried about air leaks, not vapor diffusion. Ordinary drywall is an air barrier, as long as you pay strict attention to penetrations (especially electrical boxes). Q. "It seems that putting rigid foam or plastic baffles above the fiberglass contradicts the purpose of a vented roof assembly. If you put a vapor barrier on top of fiberglass, the vent no longer can wick moisture out of the fiberglass." Ideally, your ventilation baffles will be airtight. For more information on this issue, see "Site-Built Ventilation Baffles for Roofs." You have potentially 3 air barriers at your ceiling level: The foil facing on the foam, the poly, and the drywall. You only need one, well detailed and airtight. If you can make the drywall airtight, you can skip the poly and use any polyiso foam you want, or EPS foam. If you are worried about the drywall being airtight, you can tape the seams in the foil polyiso. More air barriers will generally outperform one. If you can only have one, the best (for your climate) is the interior side. With external foam, a wall that can dry a little to the exterior (say EPS) will outperform a similar wall than can't (say same R value of foil faced foam). > so that condensation does not occur. Sigh, this old myth again. You wrote, "Sigh, this old myth again." Are you implying that a properly designed wall with exterior rigid foam will have condensation problems? Please elaborate. You wrote "The idea is to specify enough rigid foam on the exterior of your wall sheathing so that condensation does not occur." But the idea is to reduce the amount of condensation to the point where it sometimes occurs but isn't enough to cause a problem. Going beyond that, all the way to "no condensation" is unnecessary expense. Some in-wall condensation *will occur* at the minimum recommended foam R values. Really, neither of us is being technically accurate. We're both talking in shorthand, in order to make (at least in my case) an important point: If you install exterior rigid foam, make sure it is thick enough to prevent moisture accumulation problems. When sheathing is cold in the winter, and in contact with warm humid air, what happens isn't really condensation. It's sorption. The moisture content of the cold OSB or plywood sheathing increases when the warm humid air is in contact with it. In many cases, my answers are shorthand answers, to avoid technical words like "sorption" that raise more questions than they answer. But the building science behind my advice is sound: with enough exterior rigid foam, your sheathing stays dry and safe. If the foam is too thin, the siding might get damp, and that's risky. I prefer "capillary condensation", but terminology isn't the issue. It's using "does not occur" when the reality (for the typically recommended levels) is "does not occur much". There are various reasons why the difference can be significant. For example, someone might say "if there will be no condensation, why do I still need to be concerned about high Winter relative humidity?" > "your sheathing stays dry". At typically recommended amounts of foam, it typically stays dry enough to avoid problems. More foam (and other things that improve wall performance - like outward drying) are still worth considering. I'm happy to agree with you on your last paragraph: "At typically recommended amounts of foam, it [wall sheathing] stays dry enough to avoid problems. More foam (and other things that improve wall performance [especially efforts to improve air sealing]) are still worth considering." I've been making those points for years -- s0 I'm glad to see we agree. I appreciate the discussion - it is very informative for those of us not as well versed on these matters. I also appreciate the ventilation battle explanation. I had actually already read your article on site-built baffles Martin. I just didn’t quite understand their purpose. Here’s a question as per your discussion Martin and Jon: if R-7.5 is the minimum exterior foam for this climate and 2” is the maximum thickness of foam I’m comfortable hanging 3 coat stucco on, is it better to have the moisture resistance of EPS at ~R-8 or the higher insulating performance of polyiso at ~R-13? That's exactly the right type of question - WUFI might provide a useful answer. Forced to weigh various factors and guess in your case (never a good way to do design), I'd say the R13. Better than either if it were unfaced/higher perms. But note that 2" of polyiso needs significant de-rating for condensation control and at something less than R13 (but more than R8), the moisture advantage will swing to unfaced EPS. Other factors (like summer performance) will continue to favor polyiso. I agree with Jon. R-13 is preferable to R-8. With exterior rigid foam, you aren't supposed to be depending on any drying to the exterior. I’m sorry to dig this up once again, but after reading your article Martin on “Calculating the Minimum Thickness of Rigid Foam Sheathing”, I saw that you mentioned de-rating that outside layer of Polyiso in cold climates to R-4 or 5 per inch. Would it make any sense to layer EPS over the polyiso to save some cost and achieve a similar R-value? If you used a single sheet of 2” vs two sheets of lapped 1” polyiso, do you have to de-rate the full 2”? Thanks so much for the rich discussion. It’s been very enlightening. I have a Q and A discussion with Dana about exactly this. I had thought there may be some benefit to use a layer of XPS on the outside and a layer of polyiso on the inside (but both on the exterior of the wall assembly) to improve cold weather performance. Dana suspects that there would be little benefit to doing this. The usual advice is to just add more polyiso than you think you need to compensate for any reduction in cold weather R value performance. The tricky part is that there isn’t a lot of specific data on how each manufacturers polyiso will perform at specific mean temperatures of the foam. I have been contemplating building a measurement setup to run some tests for low temperatures and if I do, I will contribute my results to this forum. Regarding layers, it’s a good idea to have two layers (or more) so that you can overlap seams. It is more labor though. R value is additive, so two 1” layers adds together and will be essentially equivalent to a single 2” layer. Thanks Bill - once again, very informative. It would be interesting to run a few tests. I’m curious what your proposed methodology was? Would you build boxes out of various insulation and monitor the temperature in each? I suppose you need a few climate controlled spaces to make it truly scientific. The idea would be to build two metal plates in an insulated box. The sample would be a single square foot piece of polyiso placed between the two plates. One plate would be maintained at a constant, settable, cold temperature. The other plate would be maintained at a constant, settable, hot temperature. The cold plate would be free running to just maintain whatever cold temperature setpoint is configured. The hot plate would be regulated more precisely with a regulated power supply and PWM modulator. In this way, each pulse of current sent to the hot plate to keep it at the temperature setpoint is a unit of energy in watt seconds (joules) proportional to the current (which is fixed by design), the voltage (which is maintained at a set level by the regulated power supply), and the on time (in milliseconds). Essentially it’s just volts x amps, then the on time allows easy calculation of the net energy delivered. The energy moving through the sample is thus identical to the amount of energy input to the hot plate, minus losses out the other 5 sides of the insulated box enclosing the test apparatus (which would be minimal with enough insulation; and easy to measure anyway). From the known hot and cold temperatures, and the known energy moving through the sample, it’s easy to calculate the R value of the sample. This setup would also allow pretty much any cold or hot side temperature, and nearly any temperature delta, to be easily set and the R value of the sample measured for those conditions. Right now I’ve just been thinking of the design in my spare time. I’m actually an electrical engineer and I’ve built things like this in the past. It’s not particularly difficult to build. Might be a fun project that can provide some useful data to everyone. Also note that the "long term" rating on polyiso isn't long when compared to how long the house will last. So additional de-rating for this. I'd rate at R4 for condensation control (foam exterior to fiber) in a cold climate. For equivalent moisture performance, unfaced EPS does allow some unspecified lower R value than much less permeable foil faced polyiso. "...somewhat vapor permeable (such as expanded polystyrene over building paper and plywood), less R-value can be used and diffusion condensation will still be controlled..."
It's not quite as simple as just de-rating the outer layer. My understanding is that the de-rating is based on the mean temperature of the polyiso. If that is true, then you could more accurately estimate the de-rating by calculating the temperature on the warm side of the polyiso (this obviously depends greatly on the characteristics of the rest of the wall). Note that this holds true whether you have one 2" thickness or two 1" thicknesses, the heat flowing through doesn't know or care if the foam is contiguous or not. The R-value of the EPS (generally about R-4 per inch) doesn't change much over time. For polyiso, assume about R-5 per inch in cold weather. Don't stress too much about this -- you can be a little generous in the foam thickness if you are worried. >Our planned wall assembly, inside to out, is drywall, R-19 fiberglass batts, 5/8 OSB, 2″ polyiso, drainwrap, lathe, 3 coat stucco. R19 fiberglass is the straw-man punching bag of the insulation industry. It has such low density that it is more of an air filter than an air-retarder. When compressed to 5.5" in a 2x6 framed stud cavity it's performance is only R18. I has the same weight per square foot as an R13 designed for 2x4 walls, and when compressed to 3.5" in a 2x4 cavity it performs at R13 (not surprisingly). There is a place for R19 batts, but no place for them in a wall cavity. At the very least go for R20s, which actually performs at R20 in a 2x6 cavity. But in your wall R21 fiberglass or R23 rock wool would be money well spent. The higher density R21s & R23s are more air retardent and a more consistent loft, less likely to have compressions & voids. XPS on the exterior is a waste of time, money and performance. XPS loses performance over time, eventually falling to R4.2/inch. In very cold outdoor conditions (negative double digits F), where will be a real performance difference if the outer inch is polystyrene instead of polyisocyanurate, but even in the mountains that's less than 5% of the heating season. In US climate zone 5 it doesn't really matter what 2" foam is on the exterior- it will still have sufficient dew point control for the OSB. My personal choice would still be foil faced polyiso in a dry climate, including ignition temperature and the fact that it doesn't melt, even when burning. Foil facers make air sealing the foam layer a bit easier too.